SOCHI, Russia — Back at the World Cup for the first time since 1982, Peru isn’t leaving Russia empty handed. The Australians had to beat Peru and hope Denmark lost to France in the other Group C match. 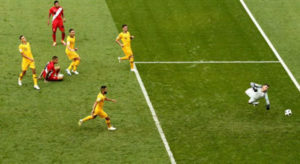 Australia needed the victory to reach the round of 16 for the first time since 2006 but it had a slow start at Fisht Stadium, unable to get near the opposing area. The Peruvians, boos-ted by a loud crowd that heavily outnumbered the Aussies, took advantage of their chances and gave their team an honorable finish after two opening losses.